That isn’t to say this person is irresponsible—indeed this man or woman is usually a close friend and confidante of your parents—sometimes, it’s almost like having a bonus set of uber-cool adults who think you are just perfect. Those aunts in my life were all nearby and I spent a good deal of time with them, and they were all ‘great’ aunts/cousins. Aunts Marse and Edith lived ‘Down Below’ and Aunts Gert and (cousin) Sis lived ‘Up Above’. Then there was of course Cousin Vivienne, in a class all by herself. When we went to visit Davis Avenue (Up Above, the house my grandfather’s mother lived in –was born in?) it meant we could wander around a huge yard, tromp up and down the street, wave to Mr. Pine next door, and generally be loud and crazy. Or come inside (to this day I could walk you through this house with a scary amount of detail), pretend to play with the huge cabinet radio, crawl under the china cabinet and remove the toys left there for us, or sit in the kitchen with the adults and have “tea”… milky, watered-down tea in a china cup and saucer, with Grandma Elaine, Mary T, Boy McNally, Sis and Gert. The upstairs of these houses is sketchy in my memory (but not as vague as the upstairs of Aunt Gene’s, where NO ONE was allowed to go) but I do recall the upstairs of Victory Blvd. At the top of the stairs was a bathroom. Palatial in size, the room had to have once been a bedroom. The toilet was on the far end and the floor slanted and the claw foot tub was on the opposite wall…Then there was a bedroom door, and then, the Attic Door. 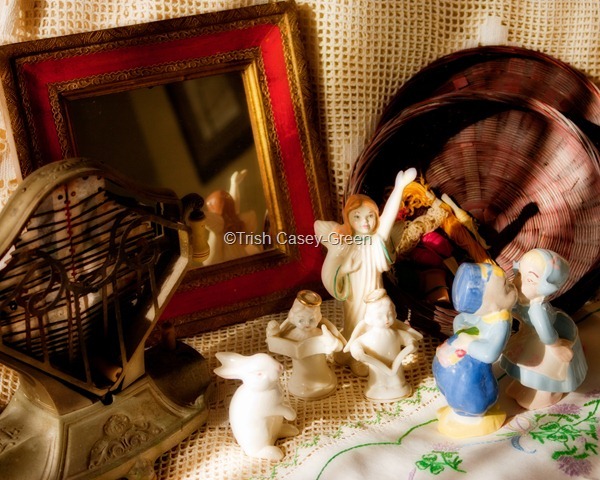 Gifts of LOVE: Many may recognize my “Bride and Groom” from my wedding cake…the little Dutch couple, a gift from Aunt Marse, as were the angels and bunny. The red mirror was Cousin Viv’s, the embroidery Evelyn’s, the sewing basket belonged to my husband’s grandmother. The table cloth is from Mrs. Hayes, and yes, that really IS a toaster from Aunt Gene. Sis gave me a turquoise ring on my 12th birthday, not from the stairs, but something that my grandmother gave her in 1927. It was the last gift she gave me before she died. Grandma was upset, because she was SURE I would lose it. It is on my finger to this day. And cranky Mrs. Hayes from next door once gave me a lovely crocheted tablecloth. Now, Aunt Gael and my mother-in-law Evelyn have continued this tradition. Gael often gifts me with some trinket or other that she owned, and loved and cared for. Evelyn, knowing I quilt, gave me her mothers little sewing basket, and one Christmas, gifted everyone with embroidered pieces that over the years the women in the family created with their hands. These gifts, whether made or simply loved by the person giving them, are more precious and should be considered of more value than any $25 gift card to Old Navy, on any gift giving occasion. The connection to family, to place, to tradition, these are the things that make the holidays ‘family times’, that create memories that the next generation passes on. Cracked, glued, broken, valued. Loved. Charming! I have the same little Dutch Kissers – they were passed down to me through my Grandma’s estate, along with a dutch-theme luncheon cloth. I’ve never seen another pair just like mine until now. Thanks for the memories! What a lovely piece – you are such a gentle soul. I, too, have these memories from my childhood, sadly I have no souveniers, too much moving, broken relationships, paring down along the way, precious things from the past slipping away…but I do have my memories of dusty, diffused lit rooms with hand made treasures, doilies, lace table cloths, embroidered scrim curtains up for the summer so the rooms were dappled with sunlight, the heavy silk draperies up for the winter to retain the warmth in the room, of weathered worn hands rummanging through the old, old button box filled with bone, ivory, fused glass buttons – fabulous jewels to the eyes of a child; the tattered hand-made lace hankies; the delicately pin pleated linen blouses, yellowed with age; depression glass dishes, in delicate pastel colors…ah yes, I remember them well…and I feel a sadness for our changed times where everything is a nano second wonder and in less than a year, another “throw-away” convenience with no history or emotions attached.